I think marshmallow peeps are disgusting, but some people love them. Julia sent along a link to the results of a Peeps diorama contest. 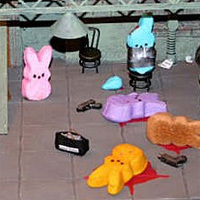 Two of the darker entries caught my attention: Reservoir Peeps (16) and Soylent Green is Peeps (17). Yesterday I took a short walk along the river. I don’t think I realized what was going on until it was over. But it was well-documented. 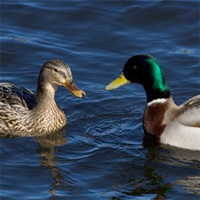 NSFW for ducks. Yesterday I was catching up on some blog reading and came across the 12 funniest people on the Internet. I started reading Dinosaur Comics and became instantly hooked. The comic features the exact same panels for every strip. There are three dinosaurs and they talk about everything from grammar to puns to encryption to a guy named Lee. It’s a bit less geeky than my other favorite webcomic, XKCD. Ah, and here’s one that made me think of Chris. Already my favorite show on TV, The Office stepped it up this week by including some multiplayer gaming. Jim, who recently transferred to this branch, is quite the n00b. Kid’s mom mistakes Castlevania FAQ for murder plans. Kind of mesmerizing. Watch the movie.